Today, on World Water Day, I am able to report that the work at Kigali Water Limited has borne great fruit. Construction of the new water facility is well under way and on track for completion in 2020. 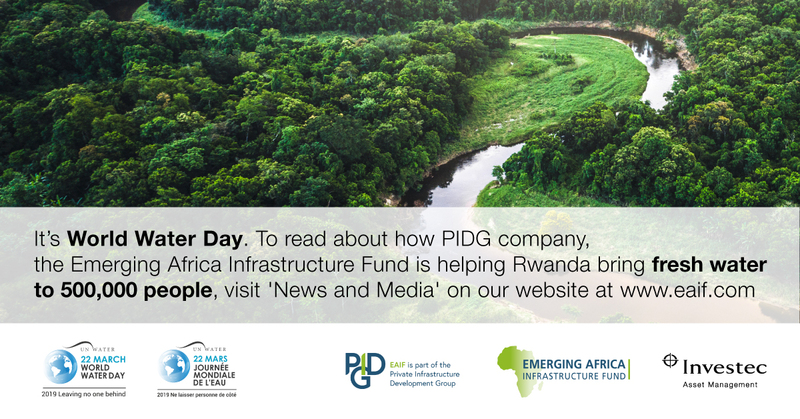 The Emerging Africa Infrastructure Fund (EAIF) is part of The Private Infrastructure Development Group (PIDG). EAIF arranged the debt finance for the project, which was awarded to Kigali Water Limited (KWL), a Rwandan subsidiary of Metito, one of the world’s largest water management and allied infrastructure companies. KWL represents sub-Saharan Africa’s largest known build, operate and supply water deal. In addition to the finance arranged and provided by EAIF, the project benefited from a US$6.25 million grant from PIDG’s Technical Assistance Facility. The grant was a significant element in the creation of the financial package for KWL, as was the role as a third PIDG company, DevCo, which provided critical support at the project evaluation and business modelling stage.